Well not quite starting at Enniskillen, but Ballinaleck, not far away. We will go to, or through, Enniskillen tomorrow. 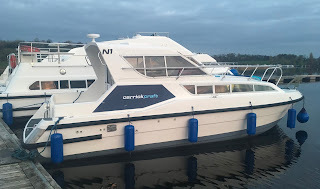 At 5 pm were were on the boat we are to return to Carrick On Shannon, but no rush, as they do not want it there unitl early April. It took awhile to bring our supplies and luggage, all in shopping bags, and trying to think of all emergency essentials like safety pins, scissoers, flashlights, storage bags etc., etc. A sort of evening sunset. We are not going anywhere this evening. 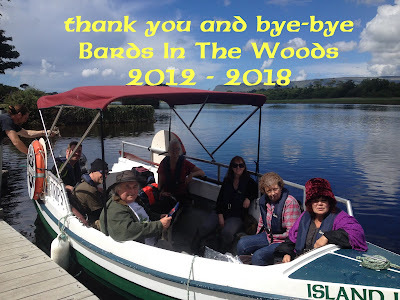 With heavy heart to let go of Bards In The Woods after many wonderful memorable times over 6 years. Hard to let go, but I wish more focus on the Carrowcrory Labyrinth Gardens events. Still keep visiting these precious woods, friends, and enjoy picnics in them. Without our interests and using them, the few remaining native woodlands will be taken away from us to create building developments, monoculture plantations, or solar or wind farms. I will keep up the web site and Facebook Page to post up more memorabilia of these times, and later reference. I am still bookable for group Bards In The Woods sessions, though. Its the Open events that are gone.